You know by now what a huge part of my life twitter is. In this post I can prove that it can really do some good, too! I’m delighted to be part of the blog tour for Jane Travers’ newly-launched book Tweet Treats today! If you don’t know about this (where have you been? ), it’s a recipe book with two differences. The first is that all the recipes are tweet-length. Yes, a full recipe in 140 characters. Crikey. The second thing is that all the profits from Tweet Treats are being donated to Médécins Sans Frontières (Doctors Without Borders), so by buying it you’re contributing to a truly humanitarian cause. You must have been asked this a hundred times, but what gave you the initial idea for Tweet Treats? Medécins Sans Frontières (aka Doctors Without Borders) are an incredible organisation, where medical professionals and volunteers give freely of their time and expertise to bring healthcare to those most in need. I really respect the fact that they are completely non-partisan, they don’t discriminate based on political affiliations, or religion, or social status – if you need help, they’ll give it. I think to a large extent as well they are the unsung heroes of the charity world. They get on quietly with the business of what they do and don’t blow their own trumpet like some other charities. For that reason I wanted to do a bit of trumpet-blowing on their behalf. I was amazed, while working on Tweet Treats, to encounter large numbers of people who’d never heard of MSF before this. If I’ve helped to raise their profile and tell people about the fantastic work they do, then I’m happy. I know you had some enthusiastic helpers rallying their followers to send you recipes, especially celebs. What was your biggest squee moment; who made you go “I can’t believe I’ve got one from…”? My helpers were incredible! Tweet Treats would have died a rapid and inglorious death if a certain group of people (of whom you yourself were one, Becca!) hadn’t stepped in and insisted on helping. When the self-styled Team Tweet Treats started rounding up celebrity after celebrity, I sat at my computer in shock! However, my biggest squee! moment came from a celebrity I’d stalked (ahem – asked) myself, and that was Neil Gaiman (@neilhimself). He’s my personal idol and when he first replied to me on Twitter I screamed, gibbered, hyperventilated and had to be plied with strong liquor by my equally star-struck husband! We had a brief back-and-forth conversation, which I copied and have saved for all time like the sad fangirl nerd I am. Did you have any favourite recipes? Actually, I do have a few. I haven’t tried every recipe in the book yet (with the best will in the world, I haven’t had the chance!) but there are a few that have become favourites already. @SanyaV gave a recipe for watermelon, feta and mint salad which I absolutely love and make all the time now; and @mduffywriter gave one for banana bread which is now a staple in our house. I also love golden syrup cookies from @Chiddle84, to name but a few. And what was your most disgusting recipe? More importantly, did it make it into the book?! The recipes you put in – how hard did you find it to come up with a recipe and fit it all (ingredients, method, everything) into 140 characters? Including the #TweetTreats hashtag! Actually, that wasn’t too hard – or maybe I just got very used to it! Sometimes people would send a recipe spread over three or four tweets and claim they couldn’t get it any shorter. I would edit it down and send it back to them to approve, and they were always amazed at how concise one could be. The hardest part was explaining what I was doing in 140 characters at a time, several times a day, every single day, to new people who’d just heard about the project. That was when it was invaluable to have a blog that I could link to where they could get a full description. How about publication? Was that a struggle or a doddle? And how was it actually compared to how you expected it to be? A doddle, in hindsight! Much easier than I expected, but I’ve since learned that it’s considerably easier to get a work of non-fiction published than a work of fiction. 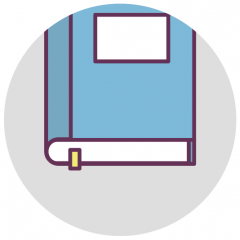 I was lucky to have Vanessa O’Loughlin of writing.ie (a fantastic resource for writers, and not just in Ireland!) in my corner. She put the proposal on Michael O’Brien’s desk in O’Brien Press and he phoned me ten minutes later to say he wanted to publish it. Working out the contract, layout of the book, format, etc took a few months longer, but I was stunned at how relatively easy it was. As someone who is primarily a writer of fiction, it was a real eye-opener for me. As far as I’m concerned, it’s been a really good way to get my foot in the door of the publishing industry. I now have a working relationship with a major publisher and I even got an agent out of it, too! I asked! No really, it was as simple as that. I’ve learned a lot from doing this project; that if you don’t ask, you won’t get, but that if you do ask, you might be surprised how willing people are to help. First of all I approached Knorr and asked for sponsorship for the book (this was before I had a book deal, even!). They very graciously agreed. Later, I asked them about the possibility of a foreword from their spokesman, Marco Pierre White. They had no say over Marco beyond a certain amount of work he does for them annually, but they kindly gave me his contact details. I wrote a letter to his agent outlining the project, and after a few back-and-forth emails, Marco agreed to donate the foreword. I was over the moon! What’s next for both Tweet Treats and yourself? 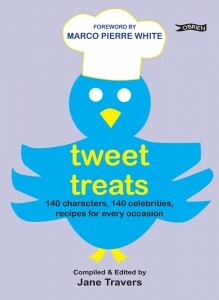 Ooh – another Twitter book, how fabulous! Thanks so much for coming on Jane, and I know my hordes of fans wish you and Tweet Treats every success! You can buy Tweet Treats here and visit Jane’s Tweet Treats blog here.